Having charmed audiences since it premiered on Broadway in 1963, She Loves Me is an irresistible a gem of a show which centres around Amalia Balash, a young woman who is hired as a clerk at Maraczek's parfumerie, much the the dismay of fellow clerk Georg Nowack. The pair can't seem to see eye to eye on anything at work, however, unbeknownst to them, they are actually both writing to each other as anonymous pen pals. 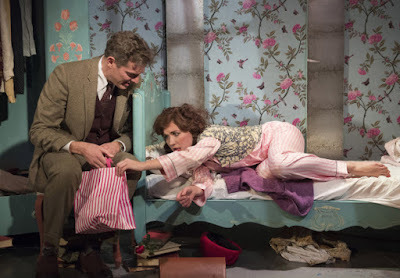 Those familiar with the Menier Chocolate Factory have come to expect the highest quality productions, with a top notch creative team and starring the cream of the musical theatre crop, and in that respect She Loves Me does not disappoint. Matthew White directs the show, led by Scarlett Strallen as Amalia and Mark Umbers as Georg. The two leads are a perfect match for each other, both exuding an endearing nervous energy. They are joined by a fantastic supporting cast, featuring Katherine Kingsley who steals the show as Ilona Ritter, a ditzy sales clerk whose supposedly secret relationship with sleazy co worker Steven Kodaly (Dominic Tighe) results in an entertaining subplot. It's impossible not to be charmed by She Loves Me. The music and lyrics of Jerry Bock and Sheldon Harnick exude glorious warmth and lyricism, with numbers like Tonight At Eight and Vanilla Ice Cream being especially good examples of this. Young star Callum Howells as enthusiastic delivery boy Arpad Laszlo also brings boundless energy to the already frantic and fast paced act 2 opening number Try Me, a song which exemplifies just how irrefutably charming and joyful the music of She Loves Me is. Despite the Menier Chocolate Factory's somewhat tiny stage, this production feels rather grand and lavish. Designer Paul Farnsworth has created an absolutely gorgeous set which fully encapsulates the sumptuousness of the dreamlike 1930s Budapest in which She Loves Me takes place. Similarly, Choreographer Rebecca Howell makes good use of the intimate venue, especially during standout ensemble number A Romantic Atmosphere, in which the patrons of a discrete rendezvous cafe cut loose to hilarious and thrilling effect! She Loves Me is a warm hug of a show, filled with glorious musical numbers, a delightfully fluffy plot and lashings of good natured humour. It's impossible to resist such a downright delectable musical, and with a wintry finale which makes the whole piece feel particularly fun and festive, She Loves Me is the perfect show for Christmastime! Visit www.menierchocolatefactory.com to buy tickets.